This page is a companion to our page about leather saddles. Rivets can pull out, or corrode. Any of these problems can be corrected. Brooks repairs saddles at its factory location in England, and as of this writing there are three other authorized Brooks repair locations around the world. Transport Cycles in Philadelphia, Pennsylvania, USA, is one. 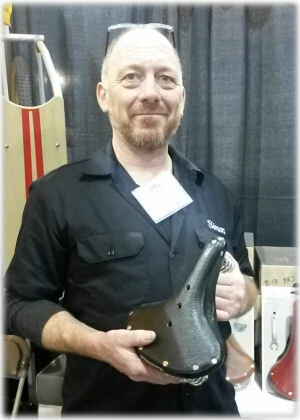 Simon Firth, at Transport Cycles, reports that he also repairs the new Cambium (non-leather) saddle, and covers Brooks warranties. Simon Firth, at your service! Brooks will extend a warranty to 10 years if a saddle is registered on its Web site. Aaron's Bicycle Repair in Seattle also offers leather-saddle repair. 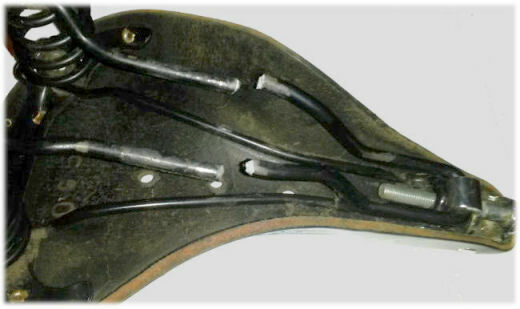 Brooks stocks and supplies replacement parts; repair of old saddles is still entirely possible, because the basic design of Brooks saddles has remained the same for decades. Repair of other brands depends on parts availability. Contact information on repair sites is at the end of this article. The most common repair is for a broken rail. A bicycle collector or museum may wish to replace the leather when restoring an antique bicycle. Some older Brooks saddles have a feature which also makes it worth the trouble to replace the leather: ferrules of the type shown in the photo below. They insert into the bag straps. Newer saddles lack these ferrules and can cut through straps. It is worth saving ferrules from a worn-out or broken saddle. They can be pried out and re-used. A home mechanic may also attempt a saddle repair, and it is sometimes possible to cannibalize parts. When a saddle rail broke on a Brooks B17 -- after 30 years of service -- I checked and found that the undercarriage of a Wright's saddle -- Brooks's low-end brand in the 1970s -- was identical except for the finish. I drilled out the rivets from a Wrights saddle and removed its misshapen leather, installed the leather from the B17 and had a perfectly functional saddle again. and a sturdy metal surface to use as an anvil. The flat surface at the rear of a bench vise will do. If you drill out the rivets from the inside of the saddle, you are unlikely to damage either the leather or the undercarriage. Drilling out rivets: the leather of this saddle was dried out and cracked. The undercarriage could use some cleaning up but it is sound. You need only replace the rivets at the rear of the saddle. The metal shoe inside the nose of the saddle comes off with the top, once you have removed the rivets at the rear. Copper rivets suitable for saddle repair are available at hobby shops and online. Genuine Brooks rivets aren't any better, and they are pricey. After flattening large rivets at the inside, you may want to pound their edges down at the outside. When doing this supporting the inner end of the rivet with a large nut or block of metal sitting on a hard druface, as an anvil, may help. Preferably, when cannibalizing saddles, use an undercarriage with matching locations of rivet holes. If the sheet-metal piece at the rear of both saddles is of approximately the same shape and width, you could drill new rivet holes -- in the metal, not the leather. The two saddles shown in the next picture are not compatible, because the width is too different. With a sprung saddle, you may be able to avoid working with rivets, by disassembling the undercarriage and replacing the broken parts. I did this when the rails broke on a Brooks Flyer. When the rails break, the nose bolt and slider come loose. Let's hope that you didn't lose it them the street -- or if you did, you ordered new ones. I had the nose bolt and slider. I was able to order a new undercarriage from Brook. This included springs, but it is easier to undo the nuts at the lower end of the old springs and re-use them, because it is possible to turn the bolts at the lower end. Keep the extra springs as spares: springs also have been known to break. Assembly of the front end of a saddle is a bit of mechanical puzzle, and can be confusing. Install the most common kind of slider at the side, from inside to outside, following the arrow in the photo at the left below. The "wings" of the slider should start facing downward (with the saddle upside-down). Slide the slider around to the front, rotate it into place and insert the nose bolt, with the nut ahead of the slider as shown in the photo at the right. Preferably assemble these parts before installing the rivets or bolts at the rear of the saddle. Getting the nose bolt into place can be difficult if the rails are in place -- though it can sometimes pop out, and if it is adjusted as loose as possible, you may be able to pry it into place with a flat-blade screwdriver, while squeezing the top of the saddle and the rails together with your other hand, to tilt the metal shoe at the nose away from the bolt. The Flyer saddle has two sets of rails.The set which is closer to the saddle top loops around the nose bolt, as shown in the photos below. Nose assemblies may differ. The one in the image below is on a Brooks B72 4-wire saddle. It is a good idea to take a photo before disassembly, as a guide before reassembling. Re-riveting an unsprung saddle is simple, but getting the wrench past the springs of a sprung saddle can be a bit tricky. Use a thin open-end wrench -- 1/2 inch for the Brooks saddles I've worked on. Getting a nut started is easier if you attach it to the blade of a screwdriver with a dab of grease, to reach in between the coils of a spring. If a coil of a spring blocks a saddle's bag loop, making it hard to insert a bag strap, loosen the nuts at both top and bottom, rotate the spring, then retighten. Sheldon strongly recommends not tightening the nose bolt. In his experience, that ruins saddles. A leather saddle with a repaired undercarriage is as good as new -- no, better than new: it is already broken in!